Gov. Rendell and U.S. Rep. Bob Brady late last night announced a tentative agreement to end the four-day-old transit strike that has paralyzed the region. If approved, as they anticipated, by the SEPTA board and the executive committee of Transport Workers Local 234, buses, subways and trolleys could be running tonight. The tentative contract agreement did not increase wages or economic benefits over the contract offer that was rejected by the union leadership on Monday. But it did provide for a graduated increase of workers' contributions to their pension fund, and it gave the union more control over "job-picking" rights, Rendell said. The five-year pact would provide for a $1,250 bonus upon ratification, a 2.5 percent raise in the second year, and a 3 percent raise in each of the final three years. It also called for workers' health-insurance contributions to remain at 1 percent of base pay. It called for a graduated increase in workers' contributions to their pensions, from the current 2 percent to 3.5 percent of base pay, and an increase in the maximum pension payment to future retirees, from the current $27,000 a year to $30,000 a year. Rendell and Brady said they hoped to be able to announce a signed agreement by 2 p.m. today. The contract will still be subject to ratification of the 5,100 bus drivers, subway and trolley operators and mechanics who went on strike at 3 a.m. Tuesday. Before last night's announcement, Local 234 president Willie Brown had proposed that both sides settle their differences through binding arbitration. The arbitration proposal was suggested by City Council members Curtis Jones and Bill Green. If SEPTA refused, Brown said, "we're in for a long strike." Brown, who was not at last night's news conference, could not be reached for comment. But, Rendell said last night, binding arbitration was never an option. The balding governor said it was more likely that "I'll be combing my hair in a pompadour" than that SEPTA would accept arbitration. 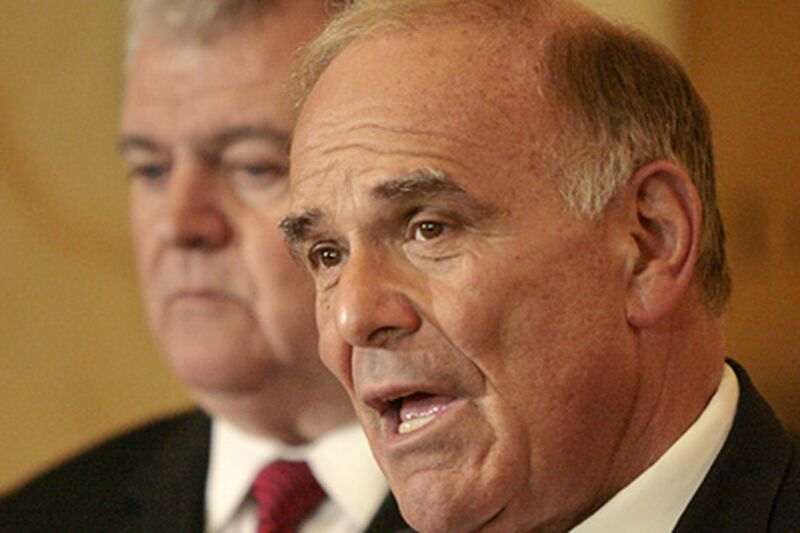 Rendell praised Brady as the hero of the negotiations who kept pushing for an agreement. "We were running out of time and we were running out of patience," Rendell said. He said he had threatened to withdraw a $6 million infusion from an economic development fund of the Pennsylvania Department of Transportation to help SEPTA meet the costs of the contract. In the end, though, the tentative agreement was "good for both sides," Rendell said. He said it gave SEPTA increased worker contributions to fund increased benefits and it provided labor peace for five years. And he said Brown "did his job," getting the best possible contract for his union members. "Given the economic tenor of the times, it's a very good contract," Rendell said, in the glare of television lights in the lobby of the Bellevue. Earlier yesterday, Brady (D., Pa.) characterized negotiations as stressful. Councilman Green acknowledged that the arbitration proposal was a long shot but said, "We're trying to come up with ways to get this resolved and let people get to and from work." Jones said traffic jams caused by the strike were "mass hysteria, and it's going to get worse. We're trying to create some kind of movement and some kind of compromise." The councilmen's involvement in the stalled negotiations reportedly angered Mayor Nutter, who was upset that they got involved with SEPTA talks but were not willing to enter the city's municipal contract talks. Rendell and Brady were also upset at the freelance negotiators, according to political sources. Nutter yesterday had raised the possibility of seeking a court order to force the strikers back to work, but City Solicitor Shelley Smith said a judge would be unlikely to issue an injunction unless there were a "clear and present danger to the health, safety, and welfare" of the public. Before the walkout, Brown had predicted a strike would either end very quickly or settle into a protracted standoff. A lengthy strike seemed more likely after another effort to reach a settlement failed yesterday morning. Rendell and Brady emerged optimistic from talks early yesterday with the union leadership after delivering a revised contract offer from SEPTA. But after TWU leaders dismissed the offer as worse than earlier proposals and SEPTA management insisted it had no more money to offer, momentum toward ending the strike died, until late in the day. So the region's first workweek without buses, subways, or trolleys ended as it began, with commuters and students clambering onto overcrowded Regional Rail trains, driving into traffic jams, walking, or riding bicycles. In the final hours of negotiations before 3 a.m. Tuesday's walkout, Nutter angered Brown, who said the mayor would not be included in future talks. Nutter said Thursday he had "no idea" what he did to provoke Brown, who called the mayor "Little Caesar" and blamed him for the union's decision to strike. Yesterday, the governor said the same thing. "He told them the same things I did," Rendell said of Nutter in a telephone interview. "I think the mayor acted appropriately," Rendell said. "He believes what he believes, and he is pretty strong about expressing it." The governor attributed Brown's reaction to the mayor to two potential factors. Second, the governor said, Nutter's tone on Monday might not have been the best. "It may have been just that his tone was a little bit more vehement than mine," Rendell said. "The years have taught me to be a little more conciliatory, to say things in a different way. . . . I'm not saying I'm a pussycat, but I may not be the tiger I was at 40."